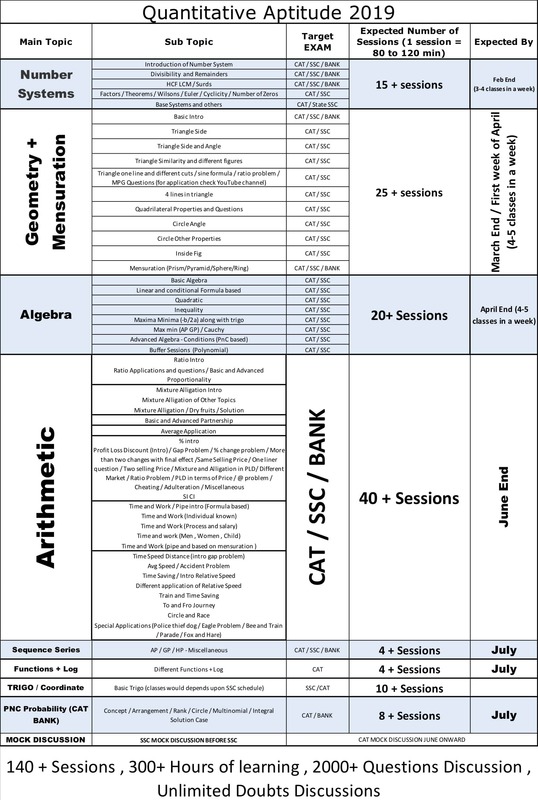 2019-01-15 CAT 2019 -Course Details. Pedagogy: Live Class 80 to 120 min[10:00 PM], Class sheet, Practice Sheet - Douts The entire course is divided into five modules keeping in mind your learning curve and the proficiency level required to crack the exam. In DI LR Anuj Sir is supporting Amiya and all of you throughout the process. Whenever Anuj Sir would get time he would be your guiding force. He would love to help you in doubts ; directions and DI LR caselets (He would take few classes as per his schedule ). Basic DI/LR : Tables; Caselets; Bar Graphs; Line Charts; Column Graphs; Venn Diagrams; Combination of two or more; Pie Chart ; Logical Reasoning ; Calendars ; Number and Letter Series; Clocks ; Venn Diagrams; Cubes; Seating Arrangement; Binary Logic; Logical Matching; Logical Sequence; Syllogism; Logical Connectives; Blood Relations.